Probate sales often occur when a homeowner dies intestate (without a will), or a homeowner dies and gives the power to sell their home to a particular person. Often, properties sold in probate court are priced lower than similar homes. Many buyers believe that they are getting a better deal. However, there are some risks involved. At Pulgini & Norton, our Boston real estate attorneys can advise you on probate sales and other facets of a residential property transaction. When a deceased person's estate exceeds a certain threshold amount, and there is either no will or a will but no living trust, the estate must be submitted to probate under the Uniform Probate Code procedures. If there is no will, the decedent's personal representative may be able to take over and administer the sale of the property by petitioning the court for a license to sell it. In some cases, when the decedent died without a will, the personal representative must petition the court for a license to sell. Alternatively, when a will allows the personal representative the power to sell the property, a separate petition is not necessary. Individual circumstances determine the timing of a probate sale of a home. At a probate sale, the court will make sure that the property is marketed and sold like other similar properties. Whoever represents the estate of the deceased person hires a real estate agent, lists the property, and shows it. The list price is usually based on the listing agent's recommendation and the court-ordered independent appraisal. If you are interested in a property being sold in a probate sale, you can make an offer. In order to get a license to sell the property, a petitioner needs to already have an offer pending from a potential buyer. The price agreed upon is part of the license, so if that price is modified, another license must be granted in order to continue with the sale. The license provided to sell the deceased person's home is granted only for a fixed period. The process after that can be unpredictable because when probate is first filed, there may be creditors' claims that are as yet unknown. Moreover, there may be potential family members with different feelings about what should happen to the property. Ownership may not be formally transferred until after the one-year creditor period has expired. 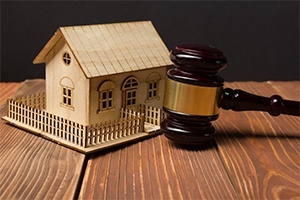 Probate sales are also risky because a seller who has died intestate cannot disclose any property defects, such as work that is not up to code, zoning issues, or other aspects of the property that may not be desirable. Before you write an offer, you should probably try to get a home inspection. At Pulgini & Norton, our Boston real estate lawyers can assist you with every step of buying your home through a probate sale or selling a property as a personal representative of someone who is deceased. Our firm also represents buyers, sellers, associations, and lenders in Medford, Weymouth, and Hyde Park, as well as other Massachusetts communities. Call us at 781-843-2200 or contact us through our online form for a consultation with a property transaction attorney.